In the past, when times were better economically, if a lawnmower broke down the owner would usually just go out and buy a new one. In today's era of a more uncertain economic outlook it makes sense for consumers to repair their tools, rather than replace them. Most homeowners own a lawnmower, and have frequently invested a good deal of money in its purchase. Even high-quality lawnmowers like Honda models sometimes need repair or new parts. Three of the most popular Honda lawnmower brands are the HRB215, HRB216 and the HRB 217 models. While the three models are similar, they do have different components. HRB 215 Parts: There are actually four different model styles in the Honda HRB 215 series: the SDA, SXA, HXA, and PXA. You can identify which exact model you require parts for by looking at the manual that came with the mower when it was purchased initially, or also by looking at the VIN number on the mower. Specialists in Honda parts will have parts specifications lists that make it easy to look up mower models by VIN. One of the best sites for Honda HRB 215 parts is www.hondalawnparts.com, an online vendor who sells every part imaginable for this mower. Commonly replaced items on this mower model include bearings, brake arm. hinge pin, and clutch assembly. HRB 216 Parts: The HRB also consists of three different model styles: HXA TDA TXA. Again a quality comprehensive online parts warehouse will help the consumer pinpoint the exact part for their exact model of mower. Hondalawnparts.com has a detailed series of specification plans for HRB 216 mowers, and also has real people available on its customer service phone number who can provide expert advice about the exact part needed. On this model it is not unusual for the clutch cable and spring to wear out after heavy use and need replacement. Because Honda mowers the body will often last a long time, sometimes requiring new drive assemblies or occasionally an entire new transmission. All of these parts are available for replacement purchase. HRB 217 Parts: The HRB 217 model series is a more sophisticated mower, with a three-speed transmission to tackle all kinds of terrain. Though the mower has more features, parts are still widely available for this mower. The HRB 217 has a hydrostatic drive and electric start feature, but these features are sturdy and rarely need replacement. Because it is so effective at finely chopping and bagging leaves, some customers buy a second grass and leaf bag from a parts retailer to extend the life of their first bag. Built to last, the Honda normally requires little in the way of expensive repair, but regular service to the mower would include replacement of the air filter. For mowers that are not started frequently, carburetors may become gummed up and clogged and require replacement occasionally. Again, a reputable Honda parts vendor can give advice and suggestions for the replacement or repair of commonly replaced Honda 217 components. 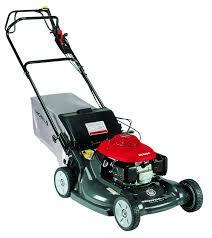 No matter what model number it is, if you have a Honda push motor, you have a high-quality and durable mower. Even the best products can require replacement parts to keep them running optimally. Preserve the value of your Honda HRB 215, 216, or 217 lawnmower by investing in quality, brand-name parts from a knowledgeable dealer. Buying the right parts ensures that repairing your lawnmower will be easier and that the pieces will all fit back together when your repair job is finished. For advice on what parts you need for your mower, contact an expert such as those at Honda Lawn Parts.